The common thought surrounding selling your home in the winter is ‘don’t do it!’ But at The Degnan Group, we’re not a fan of that negativity. Instead, we have reason to believe that bids will not be as cold as the temperatures. While it’s proven that the spring is the optimal time of year to put your home on the market to have the best odds of an immediate sale, for some homeowners, it’s not possible to wait for the warmer weather to sell. Instead of waiting for the budding flowers to bloom, embrace the cold air and picturesque fallen snow and get your house on the market. Don’t worry, we are sharing are our top five tips to increase your chances of a quick and easy sale. This may seem counterintuitive to selling your home in the winter, but it’s important to have images of your home in all its glowing glory in the spring and summer months. Show potential buyers how gorgeous your house is with inviting photos showcasing the bright sunny skies shining down and picture perfect landscaping. Although your house is on the market in the winter, buyers will be interested in seeing how your home looks without the snow piled high. Despite the cold temperatures and snow on the ground, it’s imperative to keep up the curb appeal on your home. That means clearing the snow off your porch, driveway, and entryway, and keeping everything clean and tidy on the outside. Many potential home buyers will drive by your home and scope it out before committing to an inside tour. Keeping it nice and tidy will enhance your chances of selling in the winter. Speaking of keeping up your home’s curb appeal, don’t forget to maintain the little things inside the home that will keep buyers interested. Especially in the winter months, it’s imperative to stay on top of the things you may forget about in the summer such as freezing pipes and making sure your heating systems are working. No one wants to tour a freezing cold house. Besides raising red flags about potential maintenance issues, a potential buyer wants to have a warm and positive experience while touring your home. 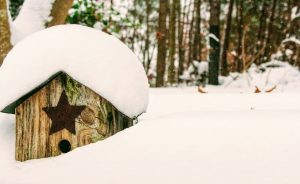 Although we believe it’s possible to sell your home in the winter, you may notice you don’t get as much foot traffic as you would when compared to selling your home in the spring or summer. Don’t be disappointed though – potential buyers in the winter mean business, they went out in the cold for a reason, right? Despite the lower traffic levels, make sure you keep your house neat, tidy, and smelling fresh. Don’t forget to turn on all the lights – a key to making potential buyers feel welcome and “at home”. We all love the holidays, but there’s a time to pack up the decorations and put them back in the attic. No one wants to tour a home at the end of January and still see nutcrackers lining the fireplace or stray pine needles dispersed throughout the house. When selling your home in the winter, decorations are a distraction to potential buyers and it’s difficult for them to imagine a potential future there. So pack it up, store it away, and instead, play up the cozy with warm fires, fresh smelling candles, and an outdoor spotlight on your house. You’ll thank us later. The winter months may seem like a dry time for the real estate market, but here at The Degnan Group, we’re ready to help get your house sold to create new memories in the next. Contact us today at (419) 345-7808 to get started.